Home » Historical » 20th Century » Are You a Clothing Addict? An addiction to buying clothing is something plenty of people face – but the problem is amplified exponentially when clothes are your hobby or even your profession. Most costume fanatics will admit that not only do they hit the high street regularly for everyday clothes, they are also constantly expanding their special collections. Reenactors have their weekend-wear, goths and cosplayers have a separate alternative wardrobe to complement their more office-friendly look. As for sewists – imagine the inspiring resource material, past projects and that huge heap of fabric that’s another compulsion altogether. The problem is entirely understandable and yet hard to deal with when all clothes storage solutions start to fail. Most psychologists see shopping like any other drug as a means of coping with another pressure or anxiety. Fortunately we can probably downplay this for most costume fans as for them the hobby aspect of clothes is more recreational than an escape. Nevertheless they are just as likely to experience times of pressure when a simple Ebay win is a huge and very welcome hit of endorphines. The problem arises when this becomes a habit that weighs on both finances and living space. No one really wants to live with a huge pile of clothes but most of us still fail to turn down some special finds each week. When your Parcelforce delivery man recognises you down the road one morning, and you live in a block of a couple of hundred flats, then you might just be seeing him too often (true story). So what can you do to curb this behaviour? The first and rather too generous option is to expand your capacity. Buy stackable storage crates and overdoor hangers so you can keep your floor clear and stop a pile forming in the first place. This is a coping mechanism and not a cure. It’s your hobby so you’re allowed to indulge a bit. A prime example of a unique Ebay treasure that will be more trouble than it’s worth to anyone without proper storage facilities. The next is a good cull. Everyone has clothes they just won’t wear anymore. Often we save things for just one occasion, “What if I have to go to a…” but in reality we could make do with other items. Avoid duplicates of similar clothing that performs the exact same function – you only need one dark suit or dress. Don’t hang onto old and worn items – if your shirts have started to fray at the collar then get some new ones from Hawes & Curtis with their three for £90 offer. Finally its time to take up the “one in one out policy”. This is the ultimate means to justify a purchase. If it cannot win over a single item in your wardrobe then you don’t need it. You have tried all you can to house your collection but anymore is going to affect your quality of life. There is nothing so frustrating as having to step over piles in a small space, unable to find what you want when you’re trying to get out of the door. 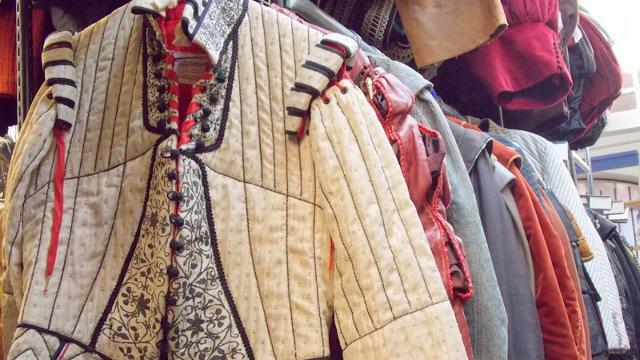 Don’t forget to read our guide to caring for historical costumes where we clarify why you shouldn’t buy pieces that are not in pristine condition. Pull back from clothes and find another hobby to invest your time and money in that doesn’t offer the same instant hit as Ebay or hitting the high street. Collecting jewellery is a good starter because you don’t need much space and you can’t afford to hoarde many treasures – although here’s a great guide to finding high-end pieces cheaper. It also keeps its value much better than clothing for future reselling.